Build full-stack shopping list apps from scratch for web and mobile platforms using Xcode, Vapor, and Swift. Increase developer productivity by creating reusable client and server components. Develop back-end services for your apps and websites using Vapor framework. 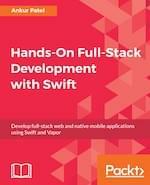 Read Hands-On Full-Stack Development with Swift. Learn how to visualize data in your Vue project with charts and graphs, to better convey and communicate information. In this tutorial, you’ll do so using the D3.js library, which combines powerful visualization components and a data-driven approach to DOM manipulation. 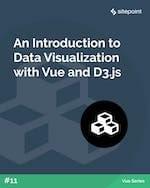 Read An Introduction to Data Visualization with Vue and D3.js. The Icon Handbook is the only resource that guides you through the complete process of designing icons - from deciding on the correct metaphor, drawing clear and understandable symbols, and implementing in your websites and apps. In this tutorial we'll teach you how to build a reusable modal component using Vue. We'll guide you through creating a simple authentication modal, creating a component out of it using Vue and then lastly, creating a skeleton modal component which can be copied and reused. 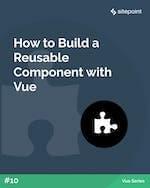 Read How to Build a Reusable Component with Vue. In this tutorial, you'll learn how to build a simple CRUD app, a tool to help students of a foreign language learn vocabulary, using Node, MongoDB and Vue. 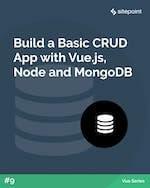 Read Build a Basic CRUD App with Vue.js, Node and MongoDB. We're releasing new content on SitePoint Premium almost every day, so we'll be back next week with the latest updates. And don't forget: if you haven't checked out our offering yet, take our 7 day free trial for a spin.